More and more galleries, museums, and collectors are willing to view web portfolios showcasing you and your work. Additionally, art galleries are discovering the benefits virtual galleries offer as sales tools capable of reaching collectors worldwide. Have a look at a demo of our world-class, basic AvantFolio website for artists. You can have one like it for only $695, including one year free hosting and domain name registration. The MRM Web Design team are experts at producing the museum quality websites artists need to showcase their work in the best light. Proficient at digital image preparation, we make certain our artist websites not only look great, but that they load exceptionally fast. Unlike low-end services offering template-based do-it-yourself online portfolios, our AvantFolios artist sites feature advanced technology, and we give every AvantFolio a special look and branding suitable to the client's work, giving the site a world-class look-and-feel. See the section below to learn about the MRM Design Advantage and why an AvantFolio may be the best investment you can make in your career. Our versatile, powerful, feature-packed AvantFolios can accommodate the needs of any artist or creative professional. 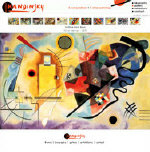 The Kandinsky Demo features an alternate gallery layout with very large images. One like it can be yours for only $695, including one year hosting and domain registration. A world-class AvantFolio artist site starts as low as $695, including full-featured hosting and domain name registration for one year. Review our online demos and experience why our Avant Folios are the most powerful and feature-packed online portfolios available. And we make it easy to expand and revise your site with our very quick service and reasonable pricing. Your AvantFolio artist website can be eCommerce empowered. Whether you wish to sell only a few prints online or you want to established a large-scale eCommerce art operation, we have a cost-effective solution scaled to your needs and budget. A full service firm, the MRM Web Design team can fulfill all your web needs, including copywriting and photography. Contact us for a AvantFolio art site proposal tailored to meet your unique needs and requirements. Spend a hour or so reviewing the artist websites listed by your local art organization and you'll probably be amazed how frequently the sites of artists, galleries, performers and art groups rank among the most lackluster, uniform, and poorly designed sites on the Internet. Even more ironic, the sites of exclusive galleries and known artists are often among the poorest of the poor in terms of design and presentation. See one of our world-class, professional AvantFolio web site for artists, featuring three gallery sections. Our mission is to provide artists and creative professionals like you with world-class online portfolios and galleries which showcase you and your work in the best possible light . . . and to make it the best investment your can make in your career. An AvantFolio will not only show your work in a dignified and professional manner, it will help distinguish you and your work in a way only a web site especially created for you can. Recently, a number of online businesses have sprung-up offering apparently low-cost, "self-maintaining" artist websites. Indeed, they appear to be low-cost, but they are not a good value over a MRM AvantFolio for a number of reasons, and we'll explore some of them below. Your AvantFolio artist website will be given a look and branding which will make it stand out from the rest. Your work will be given a dignified, prestigious, "museum quality" presentation which will significantly influence how your work is perceived by others. We individually create every web page, carefully laying out each element to produce a harmonic whole, so your entire site has an integrated look-and-feel. If you need to make an outstanding splash, choose our Elan Enhanced Design option. With it you will be assigned a personal designer who will work with you to create an entirely unique look-and-feel. See the "pricing" section for more details. I couldn't be more pleased with my AvantFolio. I chose the Elan Enhanced Design option and it has greatly enhanced my image as an artist and a business professional. Most importantly, it has already led to a number of sales. On top of that, the work was done extremely quickly and efficiently. I would highly recommend the MRM Design Team's services to anyone. Low-end web portfolios offer a limited number of lackluster "prefabricated" templates. Not only do templates generate "sameness" on the web, they restrict design and layout possibilities. And if your low-end web folio company offers the possibility of customizing templates, you must spend the time and possess the skills to do it yourself. If you're not a trained graphic artist and web developer, and think it would be a good idea to make your own web site, we offer an important piece of advice: "If building your web site is your hobby, your business or profession will look like a hobby." The MRM Design team are image processing experts. We possess the skill and experience to not only photograph your art work, but to Photoshop enhance images to make them look great. And that's just the beginning, we know how to resize, compress, and optimize images so your web images will look great and load exceptionally fast. Low-end, generic web portfolios are "self-maintaining" – that means you have to do all the work yourself – and to do it well you need patience, experience, and costly, complicated tools, like Photoshop. Shouldn't you be working in your studio or spending quality time with friends and family rather than struggling to maintain a low-end web site. The MRM Web + Graphic Design team are renowned for high-calibre work, attentive customer service, and quick turnaround times. If you want additional images or sections added to your web site, we can usually perform the work within 24-36 hours – often less. With us, it's not a matter of how long it will take us, but how soon you can email us the required materials. Still not convinced? Have another look at a basic AvantFolio. You can have one like it for only $695, including one year hosting and domain registration. MRM Web + Graphic Design means superior design, technological excellence, and outstanding value. Our world-class AvantFolio web sites for artists start as low as $695, including free hosting and domain name for one year. At first look, the best "self-managing" web portfolios may look like a bargain for about $30-$45 a month and a setup charge of $100-250, but that adds up to $460-$690 for the first year, and $360-$540 a year, each and every year after that – and you have to do the work yourself. At the end of the day, a low-end solution will not do you and your work justice. A Basic AvantFolio consists of five web pages: 1) a splash or home page; 2) an artist biography or artist statement page; 3) a Smooth Gallery Page showing a number of thumbnail images and a large image. When the viewer moves the mouse over a thumbnail (or, if your prefer, when a user clicks on a thumbnail) the large image is swapped with an enlargement of the selected image; 4) an exhibition page; and, 5) a contact page with a secure contact form. Your AvantFolio can be extended to include additional gallery pages and informational pages, such as an artist statement page or a resume page. Let's take a closer look at each page of an AvantFolio. Click on the thumbnails shown to the left of each page description below to see a live example. The Splash or Home Page is what a visitor sees when they go to yourdomainname.com. We'll create a unique Splash Page featuring your work. The Splash page also carries links to each interior web page, and if your AvantFolio includes more than one gallery, we can provide links to each gallery page. The Artist Biography page normally includes a photo of the artist and up to 1,500 words of text, and perhaps one or two small pictures of the artist's work. It may also include an Artist's Statement. Some creatives may also want to add separate pages for an Artist Statement and Resume. A Galley Page consists of several thumbnail images and a single large image showing an enlargement of the thumbnail image selected by the user. There are many possible Gallery page layouts - thumbnails may be arranged in a single row on the top or bottom, or in rows and columns. Unless you state a preference, we choose a configuration which best suits your gallery page. Additional Gallery pages may be added to your AvantFolio, either initially or at anytime you wish. To accommodate additional Galley pages, we add an extra page which acts as the Main Gallery page (far left). The Main Gallery page includes graphic and textual information regarding each Gallery. The viewer may click on the provided image and text links to view a particular Gallery. Additional Gallery pages are normally $125 for a page featuring 10 images, and you may add as many Gallery pages as you wish. To give your users a powerful, easy-to-use interactive experience, each Gallery page can include our exclusive Avant Control Panel. This $150 option places an array of extra features and functions at the viewer's control - such as toggling sound and the slideshow feature, viewing extended descriptions, sending email inquiries regarding a particular art work, as well as eCommerce functions. Learn all about it under the "Avant Controls" tab. The Exhibitions page normally lists the artist's past showings and exhibitions, as well as information regarding current and upcoming exhibitions. This page may also include a listing of your Collectors and commercial Galleries or Representatives. Some creatives and professionals may want to substitute the Exhibition page with a Client List. The Contact page can included whatever contact information - address, phone, fax, etc. - you wish to provide. Due to rampant spamming, we do not recommend placing your email address on your web site. Spammers use automated web "spiders" to search the web for email addresses to be added to their spam lists. Instead of listing your email address, we provide a secure spam-and-hijack proof contact form. With it, spammers will not be able to find your email address, and the form is also hijack-proof, which means spammers can't exploit your web site's email facility to send their spam to the masses. Additional Informational Pages pages may added at any time. While pricing depends upon actual page content, additional pages typically cost about $50 if included during the initial site build, and slightly more if added to the site after launch. Our exclusive Avant Control Panel is a $150 option which can be an integral part of any Gallery Page. Here's what does, how it works, and why your viewers will love it. Clicking the Avant Control Panel "Help" icon shows a display like this one, only it is geared for your web visitors. If the visitor is using Internet Explorer, the "Sound" icon toggles the soundtrack. Your AvantFolio does not require a sound track, and many users find sound annoying. By default, sound is initially disabled, so the user must turn it on. We can reverse the default if you wish. Also, if you require custom sound, you will need to supply us with a soundtrack in mp3 format. Sound loops are best when they are less than 30 seconds. Background sound is currently active only in Internet Explorer, and the "Sound" icon will not show if the visitor is viewing the site with another browser. Your AvantFolio includes slideshow capabilities, but you may choose not to include them. Click on the "Start Slideshow" icon to begin cycling through the images comprising the visible gallery page. Click on the "Stop Slideshow" icon to stop the slideshow. Use the slider to the left of the slideshow icon to control the slideshow speed. Changes in speed are automatically and immediately applied for Internet Explorer; for other browsers, the slideshow must be restarted for the speed change to take effect. The mouseover image swapping function - which changes the large image when the mouse is moved over a thumbnail image - is disabled when a slideshow is in progress. Clicking the "Description" icon shows a dropdown panel carrying a more detailed description of the work of art. Click the "Close" icon or the "Description" icon to close the description panel. Your online gallery may not required extended descriptions. If your AvantFolio includes a number of gallery pages, the "Galleries" icon is used to show a dropdown panel listing available gallery pages. Click on a gallery section's thumbnail image or descriptive text to view the particular gallery section. Click the "Close" icon or the "Galleries" icon to close the galleries listing. If the visitor is using Internet Explorer, the fade function dissolves one image into another when a slideshow is playing or when the large image swaps via a thumbnail mouseover. Click the "Fade" icon to enable or disable the function. Like most of the functions incorporated into the Avant Control Panel, your site does not need to include the Fade feature. Simply let us know which control panel icons you wish to have removed. Fade is currently active only in Internet Explorer, and the "Fade" icon will not show if the visitor is viewing the site with another browser. Clicking the "Inquire" icon shows a small, secure email form the user can use to send a email inquiry regarding a particular work of art. Information identifying the particular work of art is automatically inserted into the inquiry form. If you require eCommerce faculties, clicking on the "Purchase" icon displays purchase options and buy buttons for works of art, prints, reproductions, etc. We can accommodate PayPal, 2CheckOut, and other payment systems. If your AvantFolio is eCommerce empowered, the "Checkout" icon displays the user's shopping basket. From there the customer can view and edit the contains of her shopping basket, and proceed to checkout. Basic AvantFolio - with gallery page, 12 images: $695. With the Basic AvantFolio we create a unique banner which best suits your work. The banner can include your name or your logo. We generally choose a suitable color scheme and a branding font for your name, but you may inform us of your preferences when we undertake your project. If you specify a font which we do not own, you will be billed for its purchase. Additionally, unless you state a preference at the outset, we will also create a gallery page layout which best suits the proportions of images you have provided. We will perform very light Photoshop image enhancement, only when necessary, to maintain our high standards. If the images you supply require more intensive image correction and enhancement, you will be informed of our image correction fees for your project. Professional AvantFolio - same as the basic AvantFolio, except with three gallery pages and up to 30 images total: $895. Additional Images, set of 4 images: $50. Additional Gallery Page, with up to 10 images: $200. Avant Control Panel – slideshow, sound, and other interactive features visitors love: $150. eCommerce empowerment – sell your art, prints, and services online for as low $50. Elan Enhanced Design package – this AvantFolio option is for those who want to make a splash with an extraordinary design. $350+. The Elan Enhanced Design package is ideal for those who want to make a entirely unique and extraordinary presentation. With it virtually anything is possible, and you will be assigned a personal designer who will work closely with you to achieve the perfect effect for you and your work. PayPal Order Form with product thumbnails – allows buyers to easily purchase any quantity of several varied items from a single form: $100 for up to 12 items; $25 for additional sets of 5 items. This is a useful feature for artists, photograhers and art related businesses selling prints and reproductions. We can even set you up with a password protected form offering discounted or wholesale prices. See it in action. To complete the promotional package for your special event, performance, or exhibition, we can provide you with business cards, postcard announcements, programs, and brochures. We also provide copywriting, advertising, promotional, and editorial services. Professional-quality digital images of the art work or pictures you wish to show. Images should be at least 500 pixels wide, and 1,000 pixels is the preferred width. You may send the files on a CD or email the images with advance notice. If you do not have digital images, we can scan from professional-quality photographs for an added cost of about $5.00-$10.00 each – depending upon the total number of scans – which includes moderate image correction and enhancement. A listing of the works titles, dimensions, medium, and, if you wish, price. You may also want a short description of each work. The listing should be free of errors and emailed to us. A biography and, if you wish, an artist's statement and a short list of exhibitions. We will include your photo on the biography page if you provide a digital photo. Some creatives may wish to substitute a client list for an exhibition page. If you want to include additional informational pages, we'll also need text for them as well. An online art gallery featuring a number of artists and collections will require many artists' biographies and statements, as well as a listing and description of various collections and exhibitions. We will work closely with you during the early stages of the project to determine the appropriate scope and requisite features of your online gallery. Whatever printed materials which may be useful to the project, such as exhibition catalogs. If you have a logo or a graphic identity, please send us the digital files or large, very high-quality printed logos. A domain name of your choosing (pending availability). We will provide you with a free domain name and web hosting for the first year. $50 for hosting and $10 for domain name annually after the first year. Learn more about domain names and web hosting. If you require eCommerce features to sell our art, prints or services online, you will need a verified PayPal Business Account. Please supply us with a valid email address associated with the PayPal account profile. An initial payment of $400 for a basic AvantFolio or $550 for a professional AvantFolio. If your project includes options or additional images, an initial payment of 60% of the total project cost is required. The balance is payable immediately upon completion. You may submit payments by check or online using a credit card. We will inform how to make payments upon confirmation of your project. We usually require 7 days to create a basic AvantFolio, 10 days for a professional AvantFolio, after we receive all requisite materials from you. Packages with the Elan Enhanced Design option may required an additional 7-10 days.